Many com­po­nents are sen­si­tive to low volt­ages and cur­rents. A volt­age flashover in­side a com­po­nent can cause early dam­age which ul­ti­mately leads to fail­ure. To pre­vent this, at­ten­tion must be paid to proper ground­ing, e.g. by ob­serv­ing the nec­es­sary safety pre­cau­tions for em­ploy­ees such as the wear­ing of wrist­bands or by reg­u­larly check­ing the volt­age dis­si­pa­tion and earth­ing re­sis­tance be­tween the sol­der­ing tip and the power plug. In the power sup­ply, how­ever, there is often a big­ger prob­lem known as SEMP – Switch­ing Elec­tro Mag­netic Plus. Tran­sient volt­age spikes in the PE con­duc­tor up to within the KV range caused by switch­ing large in­duc­tors, trans­form­ers or mo­tors on and off. In long in­stal­la­tion lines, for ex­am­ple, these volt­age spikes are not dis­si­pated to ground through the PE con­duc­tor. They find the short­est route: socket - con­nec­tor plug - sol­der­ing tip – Com­mon Point Ground (CPG) – to build­ing ground. This means that there is a dan­ger of dam­ag­ing ESD-sen­si­tive com­po­nents even if the sol­der­ing sta­tion is prop­erly con­nected. Mea­sure­ments have shown that a volt­age of 29.6 ssV can still be pre­sent in the PE con­duc­tor after switch­ing the neon light­ing on/off. These volt­age spikes are suf­fi­cient to dam­age ESD-sen­si­tive com­po­nents. Be­fore a de­ci­sion is made on the de­ter­mi­na­tion of ESD pro­tec­tive earth, there­fore, the PE con­duc­tor must be checked for volt­age spikes. If there is the slight­est doubt, then Com­mon Point Ground (CPG) on the work­sta­tion is used for ESD pro­tec­tion in­stead of the PE con­duc­tor of the mains cable. This, how­ever, is not pos­si­ble with all sol­der­ing or re­work tools. In this case, the Weller sol­der­ing and re­work sta­tions offer an el­e­gant and sim­ple so­lu­tion - a 3.5 mm jack plug. If this plug is in­serted into the des­ig­nated socket, the ex­ter­nal PE con­duc­tor is in­ter­rupted. 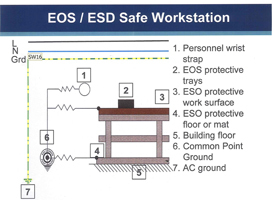 In this case, the tool would be po­ten­tial free – which is the worst ESD pro­tec­tion. A flex­i­ble line at the cen­tre of the con­nec­tor solves this prob­lem. The end of the line is con­nected to Com­mon Point Ground (CPG) and the sol­der­ing tip is con­nected to work­sta­tion po­ten­tial – a spike-free work­sta­tion ground­ing point. The end line is mated to the work­sta­tion sur­face – the clas­sic method of po­ten­tial equal­i­sa­tion. The best so­lu­tion is that the sol­der­ing tip has the same sur­face po­ten­tial as the work­sta­tion.